When you’re planning a bachelor or bachelorette party, average just won’t cut it. You need to find something that will make your celebration stand out and be unforgettable. 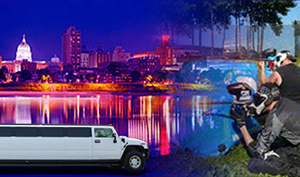 Premiere #1 Limousine has the perfect solution: bachelorette and bachelor party packages. It doesn’t matter if you’re planning to party the night away in Lancaster, Harrisburg, Mechanicsburg or anywhere in between. Our chauffeurs will get your whole group where you want to go. And that includes one of the newest attractions for bachelors and bachelorettes: Paintball! What Is a Premiere #1 Limousine Paintball Party Package? If you’re not familiar with paintball, it’s incredibly fun and absolutely hilarious. It will not only bring out the competitive spirit in every member of your group, but it will also provide you with years of conversation, as well as plenty of opportunities for laughs and hilarious pictures. You don’t have to be an expert at paintball to have an awesome time playing, either. As long as you’re up for a little adventure, you’ll love the experience. This paintball party package is the perfect way to celebrate a birthday, bachelorette / bachelor party or a fun day with friends. Start your day by checking in to the brand new Sleep Inn and Suites Harrisburg/Hershey. Once settled, Premiere #1 Limousine will provide transportation to Roundtop Mountain Resort where your group will enjoy 4 hours of paintball action and a brief intermission for lunch. Premiere #1 Limousine will then take you back to the hotel where you can lick your wounds or celebrate your victory while getting ready for a night on the town. Once everyone is looking their best, Premiere #1 Limousine will pick up your group and head downtown for a night to remember. Enjoy 4 hours of hitting up Harrisburg’s best bars and clubs in style, while wearing your VIP wristband that entitles each person to 3 or 4 free drinks at participating bars. At the end of the evening, coast carefree back to the hotel and trade stories about your day with your closest friends. $155.00 Per Person Without Hotel* – Pick up from Hershey/Harrisburg area residence. Price could change, based on location. What’s Included with your Paintball Party? #1: Do we have to be planning a bachelor or bachelorette party to hire you for a paintball party? Nope! As long as you have a group who wants to get together for a couple of fun days, we’ll be happy to develop the ideal paintball party tour for your needs. Consider calling Premiere #1 Limousine the next time you want to create an awesome atmosphere to celebrate a birthday, anniversary, promotion or any special occasion. #2: Is your Premiere #1 vehicle clean? Yes! All of our vehicles are spotless, because we clean them thoroughly inside and outside before and after every use. This means you only get the best-of-the-best. We know that you have choices when it comes to limo services in central PA, which is why we continue to set the bar high. #3: What if someone in our party doesn’t want to play paintball? If there’s a member of your group who isn’t interested in playing paintball or cannot play paintball, that’s okay. Our birthday, bachelor, and bachelorette paintball party packages aren’t just about the paintball. They’re also about togetherness and creating memories. #4: Will you really come to our houses to pick us up? It’s what we do best! As long as you live within the Harrisburg or Hershey area, we’ll come right to your door to give you a chauffeured pick-up. We can also pick your party up from locations in York, Lancaster and the Camp Hill-Mechanicsburg area for a small additional fee. If you have guests who will be riding in the roomy limo bus or one of our spotless vans who don’t live in this area, please plan to have them drive their private vehicles to the home of someone in your group who lives in the region. Have other questions for us? Want to talk to our booking specialists about party bus rentals in PA for other occasions? Just give us a call and we’ll make sure your next outing is memorable, safe and cost-effective!